A top trip to Iceland! Pupils from Holy Cross enjoyed a trip-of-a-lifetime to Iceland – and were lucky enough to see the Northern Lights. The trip was organised by the science department for Year 7-10 students. 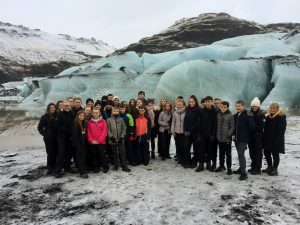 “They thoroughly enjoyed exploring the landscape, including the trips to the creeping glaciers, the lava fields, the various eruption sites and three separate waterfalls where they got to explore above, in front of and behind the various water flows,” said Head of Science Mr Power. “Add to this the geothermal power stations, geysirs, black sand beaches and a swim in the Secret Lagoon, they gained a truly enriching educational experience.